Visit the Capitol Building | Top Places to See in Washington, D.C.
Top Places to See in Washington, D.C. 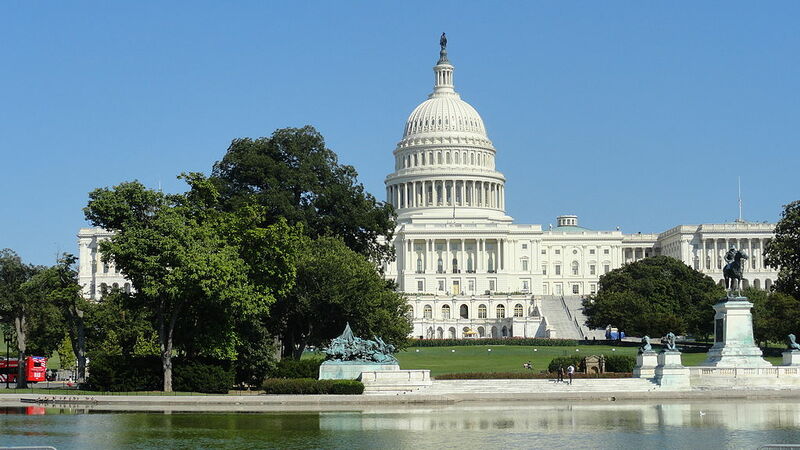 The US Capitol Building is one of the most important, and readily recognized buildings in Washington DC. It is home to the federal legislative bodies, the House & Senate, and one of the oldest structures in the capitol. Construction began in the late 18th century, and both the north and south wings were finished by 1811. During the War of 1812 however, the British partially burned the building, leading to seven years of reconstruction. After this, the rest of the building was built, with the front steps and rotunda. Starting in 1850, expansion began, doubling the length of the building, and replacing the Capitol dome with one three times its height. In pictures of Abraham Lincoln’s inauguration, you can see the construction in progress. The Capital Building is a masterful work of art, built in the neoclassical style, and adorned with numerous statues and murals. Through the oculus in the center of the rotunda ceiling you can see The Apostheosis of George Washington, a painting by Constantino Brumidi, suspended 180 feet above the floor. Around the walls, directly below the 36 windows encircling the rotunda, are a series of 19 paintings of American history, made in such a way as to appear to be made from carved stone. The walls around the rotunda also contain eight murals, like the famous Declaration of Independence, by John Trumbull. Eleven statues also surround the rotunda, with notable people such as George Washington, Dwight D. Eisenhower, and Martin Luther King, Jr.
As both a historical building, and a beautiful building, the US Capitol is definitely a place you’ll want to visit. There are a number of ways to spend the day, depending on how much time you have. You can walk around the Capitol grounds, rest in the Summerhouse, enjoy the view of the capitol, take a guided tour, go to the Capitol Visitor Center, get a gallery pass to see Congress in action, and maybe even meet your member of congress! Tours of the Capitol are free, and available Monday through Saturday from 8:50 am – 3:20 pm, except for Thanksgiving, Christmas, New Years, and Inauguration Day. Because of the popularity of the tours, you should book your ticket well in advance, by making a reservation here. Tours last approximately one hour. If you spend the day at the Capitol, you can enjoy a variety of food at the visitor center, and buy a little something at the gift shop. Getting to the Capitol is easy, whether by car, bus, or walking. Josiah works primarily in web development and writing, and once wrote a 50,000 word (unpublished) novel in a month. He also loves to travel, and explore different cultures and locations. Places to See in Washington, D.C. Welcome to our web site! Since 2007 we have provided insightful travel advice for the Washington, D.C. area. We're focused on providing links to the best online resources and giving our own advice about the places to see and things to do in Washington, D.C. We welcome your feedback! © 2013 Places to See in Washington, D.C. All rights reserved.